Sup all! Been lurking for awhile, figured I'd introduce myself and make it official. Diet: pretty clean/balanced. Very few sweets, no sodas, lots of water. pulled my groin last week so when I come back I'm going to try Project Vertical from Tyler Ray. We'll see what happens. End goal is a 45" RVJ. So thats me. Hey Chris. Nice to see another noob here. Looks like you've got pretty decent numbers already. How long have you been training? Have you been following any particular training methodology or, like you said, just doing your own thing? Training seriously as in lifting/sprinting/etc with consistency? Since April of this year so, 5 months. I've always been very active, played ball, ran track, etc in HS. I never lifted though, just ran and jumped a lot but it was effective apparently. As far as how I've been lifting since April, it's not really patterned after any particular program I just got in the gym and lifted twice a week (usually Monday and Thursday) and did some running once or twice a week as well. the lifts I focused on in particular were/are the squat, squat jump, and depth jumps/box jumps with some lunges sprinkled in. Really basic stuff. I started with a max squat of around 225lbs but was at the 300lb mark in 2-3 weeks by learning the form/getting comfortable. The 360x3 PR came last Monday and I feel like I'm still gaining but I pulled my groin Wednesday sprinting so I'm taking a week or so off. I was following Chase Skinkis (I think thats how you spell his name) and Tyler Ray on youtube and Chase in particular seems to have made some good gains using Tyler's program so I'm going to try it when I start up again. After I use that I'll probably try to structure my own thing based on the lifts/exercise I feel help me the most. FYI the only 'problem' I had doing my own thing was that while my vert has gone up I am jumping slower it feels like. it's just not as explosive feeling. I think I lost some 'springiness' (lol) during training but I'm making up for it by being stronger. After reading on here I should probably be focusing on maintaining my strength and work on being quicker in my plant/jump. Nice work. They're great gains in a relatively short period of time. Probably shows that you're applying yourself well. Yeah I've seen Chase's vids as well. Unbelievable jumper. He's posted on here before too and I think there's a bit of info on Tyler's program too. I'll be interested to see how you go. I'm getting back into lifting now with a max squat at the moment around 225 too. How did you find the transition from 1 foot to 2? I'm a one foot jumper but want to increase my efficiency on two feet as well. Did it take you long to get comfortable with it? It kind of just happened. After the knee injury my body just decided it was more comfortable off of two for max height jumps. It took a few weeks but that was mostly me just getting back into the swing of things. I'm kind of weird I think tho, my lr plant and rl plant 2 foot jumps aren't too much different in terms of vert. I think its because I've played bball my entire life so I've just got accustomed to jumping in whatever situation I'm in. 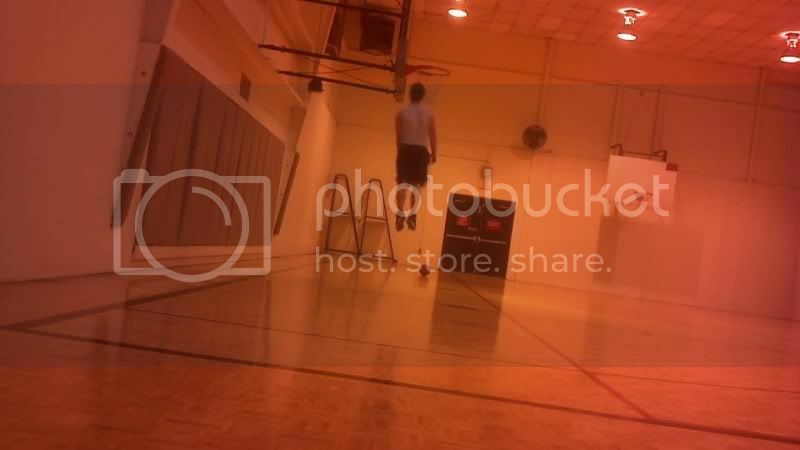 For instance friends and teammates claim I still get pretty high (relative to my two foot jumps) off one foot in games. Idk. I definitely feel more stable now on dlrvj but I think thats becuase my p-chain is lacking a little so for testing purposes I still use a rl 2 foot plant and jump. In my short lifting experience increasing my squat definitely helped the 2car foot jumping. Increaaing that should correlate into good gains for your dlrj's. That and repetition of the jumps. Yeah that's funny. Thinking about it I would use a RL plant but am sure in games I use either one depending on the situation. It's definitely an advantage having a history of playing ball. I have a few mates who are stronger than me with more trianing experience but who lack the efficiency built up playing ball over 25 odd years (wow that makes me sound old- only 32 though). That's what I'm hoping. I had the squat up to 125kg not too long ago so shouldn't take me too much to get back there and further. That'd be nice wouldn't it. I'm 6'4 so have some height on both you and Chase and would be happy to be nudging 40" running. Will also be interested to get your reviews/feedback on the Project Vertical program. I've seen a lot of vids but know next to nothing about it. 6'4" with a 40" vert would be flying! I'll start a log when I get back and measure progress with it there. If it gives me even a few inches over a cycle I'll be happy. Progress is progress lol! The bball background is huge IMO, plus it forces you to jump quickly which helps. Will be keen to see how you go.